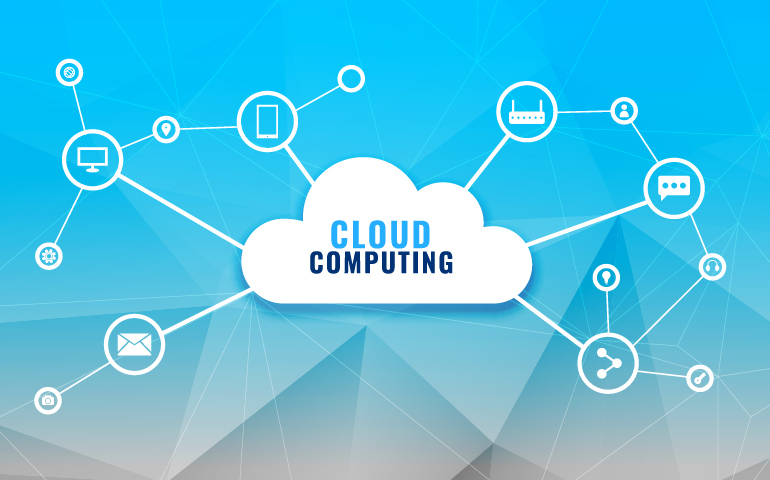 Share the post "Rapid adoption of cloud computing shows that cloud is here to stay"
Cloud computing is booming right now and there is a lot of hype regarding it. But how do you separate fact from fiction and recognize what is right for your business? One of the best ways of analyzing this is to look at the market adoption trends, not just the projected figures, but the current adoption figures as well. Here are some of recent insights and findings from Logic Monitor’s Cloud Vision 2020: The Future of the Cloud Study. Digitally transforming enterprises (63%) is the leading factor driving greater public cloud adoption today. 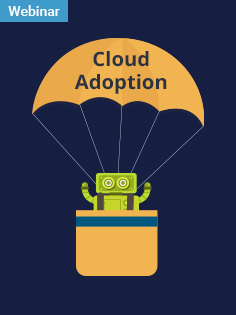 Attaining IT agility (62%), excelling at DevOps (58%), mobility (55%), artificial intelligence (AI) and machine learning (50%) and the Internet of Things adoption (45%) are the top six factors driving cloud adoption today. Nearly 66% of IT consultants are saying that security is their most significant concern in order to adopt an enterprise cloud computing strategy. According to the study, 83% of enterprise workloads will be managed in the cloud by 2020. Approximately 50% of IT professionals believe artificial intelligence and machine learning are playing a key role in cloud computing adoption today, and it is expected to rise up to 67% by 2020. Many believe that AI and machine learning will be the leading drivers of cloud computing adoption by 2020. The primary aim of this study was to explore the landscape for cloud services by 2020, and based on the current adoption trends and research outcomes, we can be certain that ‘the cloud will definitely be here beyond 2020’. Additionally, a report by IDC (International Data Corporation) states that IT spending will be cloud-based by 2020, reaching about 60-70 percent of all IT infrastructures. Hence, we can expect to see a promising year ahead that will deliver multiple IT solutions to meet the expectations of consumers. 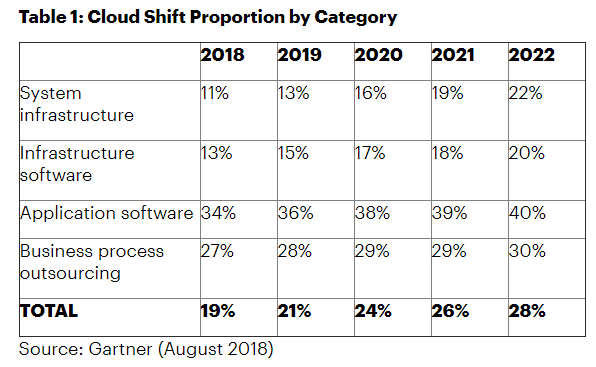 Here’s another finding from Gartner, “Market Insight: Cloud Shift – 2018 to 2022”, that talks about cloud shift proportions in various categories. The below figures explains how enterprises are investing on key areas of enterprise technology and how they are expected to shift to cloud. Higher investments are occurring in cloud computing compared to traditional software. Application software is expected to remain in IT segment with high investments as companies around the world are rapidly moving towards modern business infrastructure. Here’s how you can get started with your cloud journey. Your journey to the cloud begins with the right understanding of how it can impact the organizational goals. You will need to identify whether you require building a private cloud capability or public cloud resources. First, assess your current application portfolio to address the list of applications that require being on the cloud. Many organizations take time to research processes and tools for managing risks, issues, decisions, and budget. Once you deploy your prioritized applications, your service level and operational levels can be easily monitored. Additionally, your application performance and availability are measured to meet the new cloud services. This approach will provide you with continuous feedback so that you can incorporate industry specific improvements anytime. Setting up smaller steps on the ground level for larger leaps can help your cloud journey. It is advisable for organizations to ‘test the waters’ and carefully pick the applications for a cloud pilot effort. The pilot testing will enable your organization to gain familiarity with the cloud, and uncover unique business challenges and allow for improved planning for the rest of the journey. The C-Level executives in your organization will prefer this as it will analyze the real-time gap assessment and provide clarity around the required level. Your actions may include efforts to execute each application migration, opportunities to redefine your migration plan, identify processes for improvement, and address resources or skills gap relevantly. • Have an enterprise-wide view in order to meet the needs of all your departments. If you wish to know more about cloud services platform, kindly get in touch with our cloud experts and build on the opportunity to increase the scalability of your business operations.